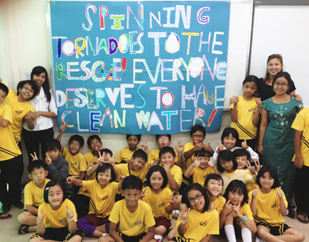 Spinning Tornadoes To the Rescue! I’m excited to say that my third graders, the self proclaimed Spinning Tornadoes, have out done themselves. Through weekly bake sales and an all school walk-a-thon, they raised not the original goal of $2,500, but $3,814! This money will give 153 people clean water for life through Water.org. I’m very proud of my little troop. So excited for you and your kids! HOW exciting? Did they feel like it was a totally great accomplishment? You must be getting ready to head out of there. How is the job hunt going? You leave at the end of Feb, right? So glad you will be moving on. What a year you�ve had. I wonder how your mom and dad are doing also?? Not much doing here. Tonight Colin and I went out to dinner for mutual birthdays and had a great steak at Ringside. He�s in the middle of busy season, so it was nice to get caught up. I have not heard from him much! He�s doing well though. Let me know what else is going on over there!